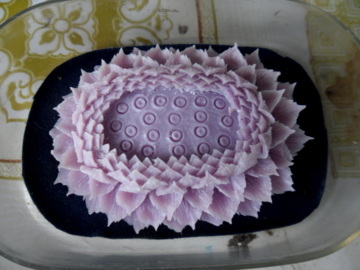 The Thai soap carver Damrongsak Nirand’s delicately crafted soap carvings are a joy to behold. 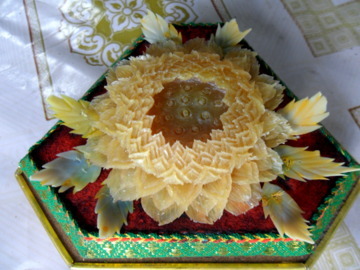 It’s a family tradition started by his father Ruen Nirand that preserves a very special Thai handicraft. 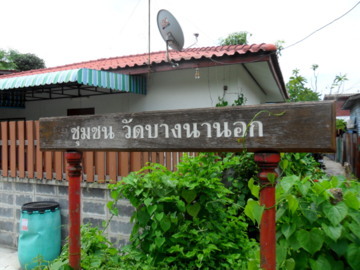 It wasn’t easy finding the home of Ruen Nirand with only a house number and general location.I didn’t have the complete address and most of the younger residents in the neighbourhood have never heard of him. Finally I was lucky enough to meet an older resident who told me that Ruen has passed away and that his son has continued with the trade.This senior gentleman was also kind enough to set me in the right direction to the house. It took another resident to guide me through the narrow lanes before I finally got there. Damrongsak, the son of Ruen Nirand welcomed me to his home. 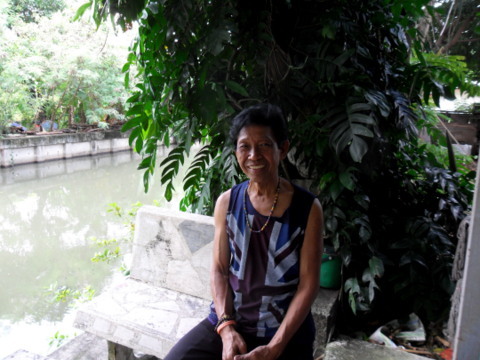 We settled down on the marble table in the backyard by the canal which flows past his home. This is his fascinating story on the careers of both father and son. 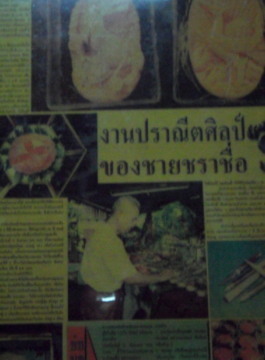 To get there, please see map to the Thai soap carver. 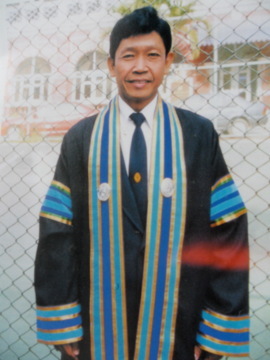 Ruen Nirand’s first career was with the Royal Thai Navy where he rose to the rank of captain (equivalent to an army colonel). 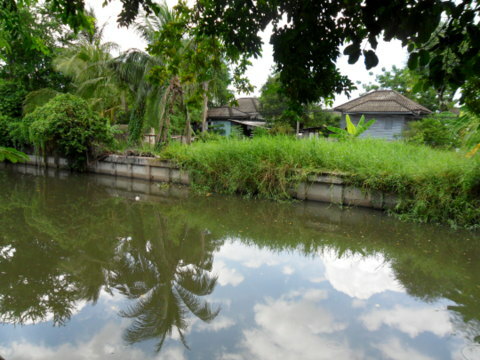 The naval camp where he worked is just across the canal from the present home. 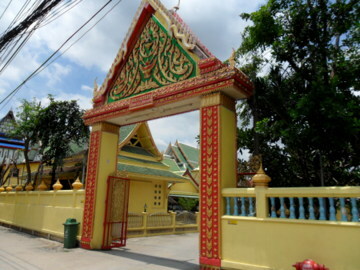 Damrongsak was born and grew up in that camp. When Ruen resigned from the navy, the family moved to the present location. Damrongsak lives with his brother, his mother lives in the next house and their relatives live in a cluster of houses nearby in the closely-knit Wat Bang Na Nok Community. Ruen took on a second career in traditional sculpture and soon became famous as a Thai soap carver. 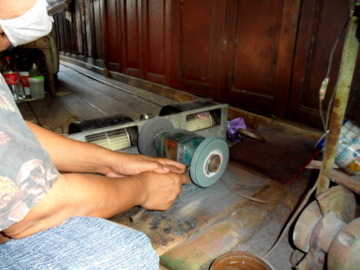 In 1996 he was awarded as an outstanding contributor to the conservation of Thai culture in the craftsmanship category. Looking at some of his works, you can understand why. 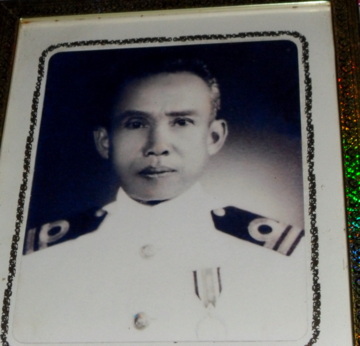 Meanwhile his son Damrongsak joined the Navy and reached the rank of Chief Petty Officer. Like his father he resigned and later graduated as a teacher in the Arts specializing in sculpture. He followed his father and learnt. 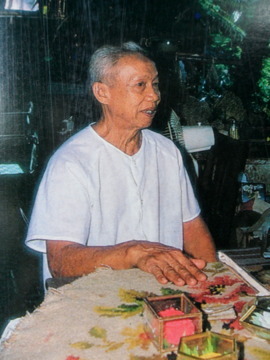 Khun Ruen died in 2006 at the age of 94. 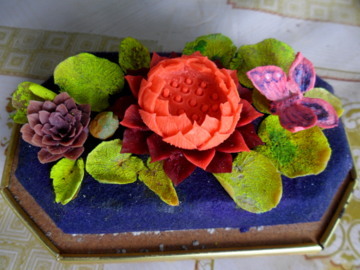 By then, the skills of the Thai soap carver have passed on to the second generation. 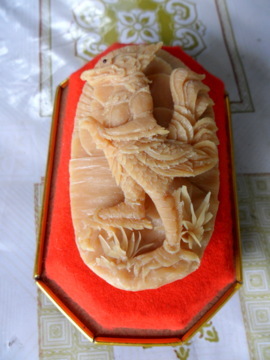 Damrongsak continued with his father’s legacy of soap carving. I have always been curious to find out, why use soap? 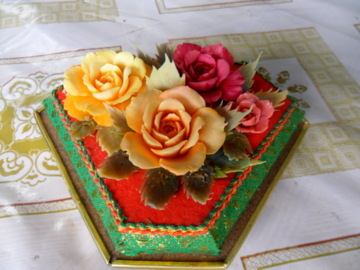 Thai carving involves very elaborate and intricate designs. 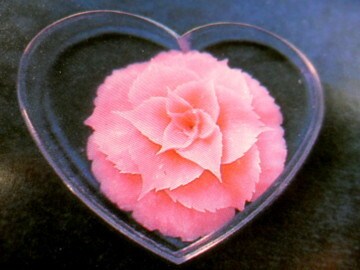 Therefore the material used must be firm but also soft enough to carve the detailed designs. Fruits like water melons and honey dew meet these requirements but fruits are perishable. Soft wood can be used but it's are not easily available. So soap is a good compromise. 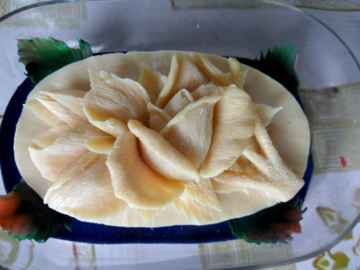 To my surprise, some of the soap carvings in Damrongsak’s collection are more than thirty years old! As long as they don’t come in contact with moisture or water. The only problem is that the original colours fade. 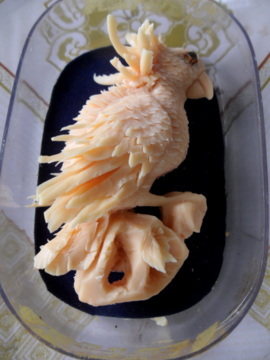 This can be overcome by painting or dying the soap carvings on completion.The next trade secret in the soap carving kit is the carving knife. 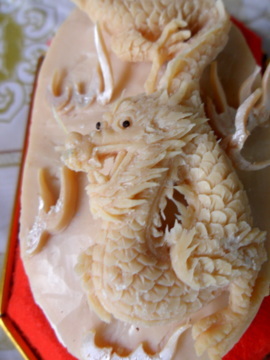 The Thai soap carver uses a very special carving knife to carve the intricate designs. 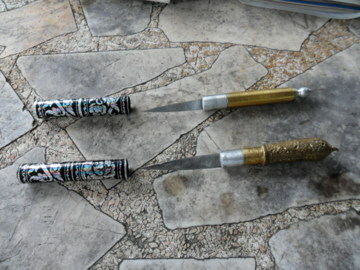 As such knives are not easily available, they are custom made. 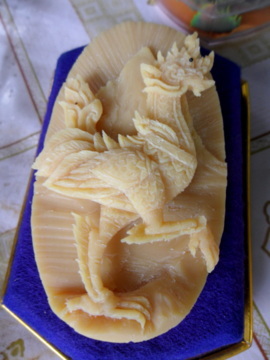 This carving knife was specially designed for soap carving by Ruen Nirand. Since then, the family has been making their own carving knives. In the next house, Damrongsak’s younger brother was working on a new blade. The first machine cuts the blade and the next one sharpens it. His elder brother Pichai is a National Artist who is planning to open an Art Museum in Nakhon Chaisri soon. So art runs in the family. 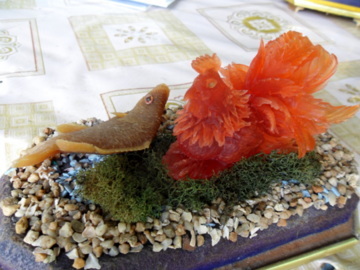 Here are some of the soap carvings from the family collection. 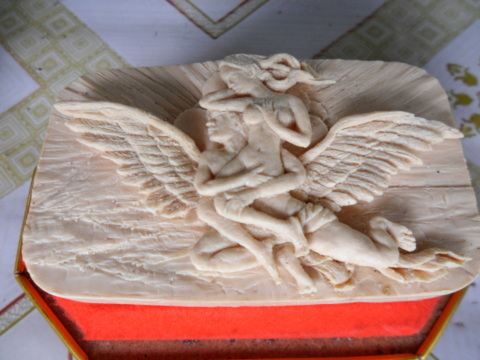 For carvings of statues and mythical creatures, photos are used as models during the carving. 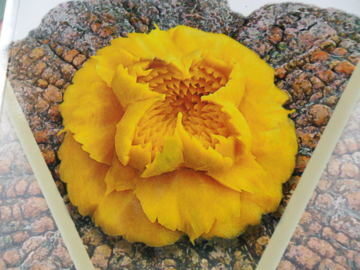 For flowers, it’s left to the natural display and the imagination. These are two of my favourites. Note the intricate details in the carvings. Damrongsak is 64 today and has been in this trade for 36 years. His advice to those aspiring to be soap carvers is to have the patience and concentration, maintain a peaceful and unhurried state of mind. No datelines are set for completion; he just carves every day till the work is done. Damrongsak refuses to sell these carvings over the years even though there were many offers. He prefers to teach and pass the skills on to preserve the continuity of the craft. 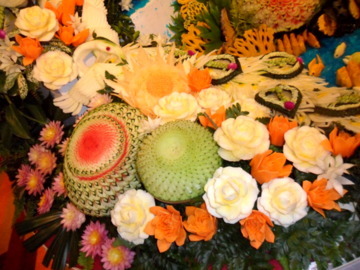 Damrongsak didn’t attend the recent fruit and vegetable carving contest held at the Grand Mercure Fortune Hotel on 9 August 2012. He said that many of the participants were his students before. 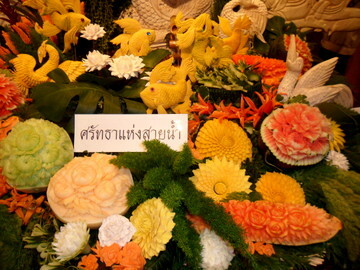 Here are some of the works from the former students of the Thai soap carver. 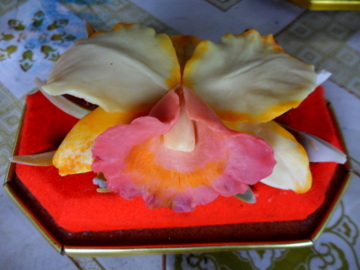 Lastly, I was privileged to be invited indoors to tour the home of the Thai soap carver. Pride of place on the wall went to a photo of his father in naval ceremonial uniform. The other item I noticed was a framed enlargement of a newspaper interview with Ruen Nirand. Next to the photo was this stunningly beautiful poster by the Tourism Authority of Thailand (TAT). 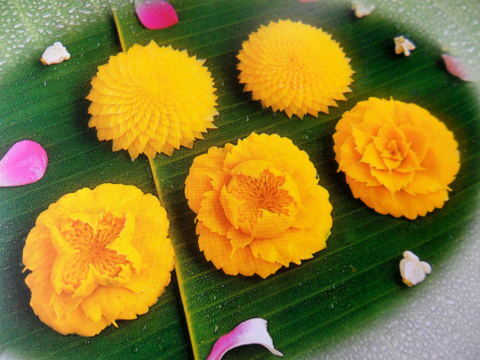 In 2011, TAT commissioned Damrongsak to produce the fruit carvings for a promotion poster. This was probably the only time he had to work under pressure. 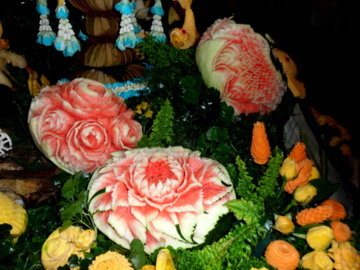 The four of them, Damrongsak, his brother, cousin and a student worked for a full day and night to produce these fruit carvings! The two ladies in the poster, of course, are real. Take a skytrain to Bang Na station and walk to the junction of Sukhumvit Road and Sanphawut Road where there are "song taeow" or red passenger pickups that go all the way to the Bang Na pier (fare 7 baht). Or you can take a taxi or motor bike. 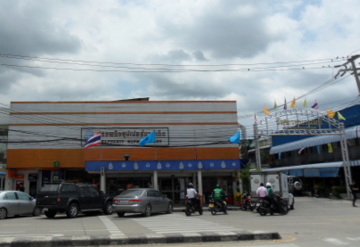 The Sappakit Supermarket and Wat Bang Na Nok arch are the landmarks indicating Soi Sanphawut 23 (there is no street sign). Walk all the way in to Wat Bang Na Nok which is on the right. Opposite the entrance of the temple, you will see this sign. 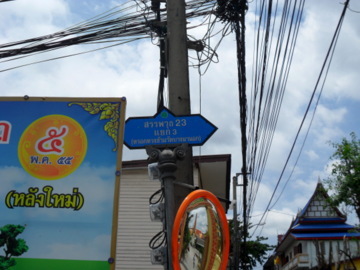 Turn left and go all the way in till you reach the Wat Bang Na Nok Community. By now if you still can’t find the house there will be enough people who know the way. 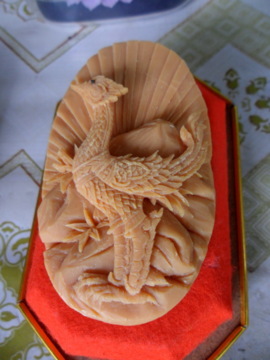 Or you might find it more convenient to visit him at the Chatuchak weekend market where he gives soap carving classes. 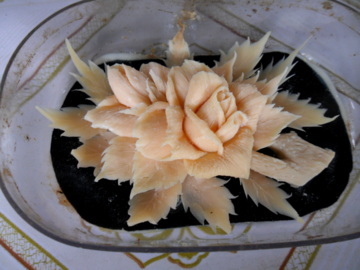 The soap carving course is 15 hours divided into five lessons of three hours each. 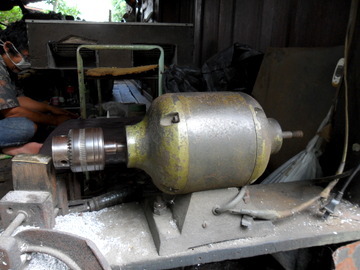 Fees are 5,500 baht which includes the carving knives and carving material. Initially, students will carve on pumpkins, later when they are more proficient they can switch to actual soap. Students can take a lesson a week and finish the course over a month or finish it as soon as possible. I have always been impressed by the Thai artists, artisans and craftsmen whom I have met. They are filled with pride, commitment and passion in what they are doing. Their humility and openness as they showed me their works and explained to me how things are done are very much appreciated. It is a pleasure to meet craftsmen so skilled in their craft and dedicated to their cause. Damrongsak Nirand is just such a Thai craftsman. I am grateful for his hospitality and effort which he took by displaying all his carvings which were stored in a box, all his art magazines and old photos. Thank you Damrongsak once again! 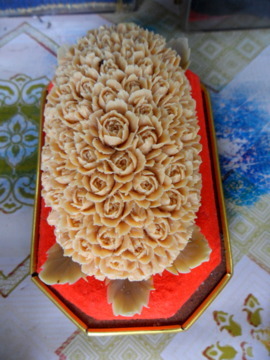 All photos of the soap carvings are with the kind permission of Damrongsak Nirand for which I am very grateful. This article is dedicated to the father and son who have strived to preserve the heritage of this very special Thai handicraft.